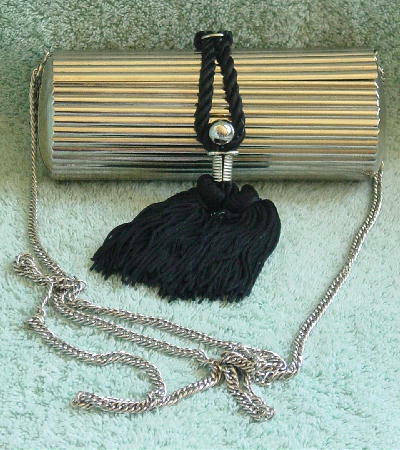 This vintage horizontal ridged cylinder shaped silver-tone metal evening purse was made in Hong Kong. 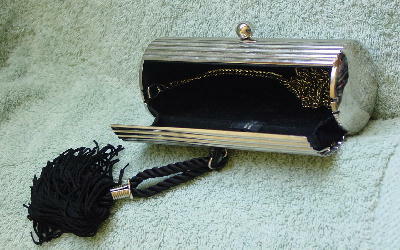 It has a black brushed cotton lining and a silver-tone ball and black cord and tassel loop closure. There are actually two black tassels. The sides of the purse do not have ridges. It has a 46" long silver-tone chain shoulder strap which can be tucked inside and carried as a clutch. The right side of the lid doesn't fit as tightly as the left side. There is some slight tarnishing on the round ends and some of the ridges. It's from a French model, who wore it to several awards ceremonies and her boyfriend's movie premiere.